Boxer supports your Gmail, Exchange, Outlook, Yahoo, Hotmail, iCloud, AOL, Office 365, IMAP & POP3 email accounts. Boxer connects you to your favorite services like Evernote, Facebook, Linkedin, Twitter, Dropbox, and Box so that you can get more done in less time. Upgrade to a better email client today. Download Boxer for all of your Android phones and tablets! 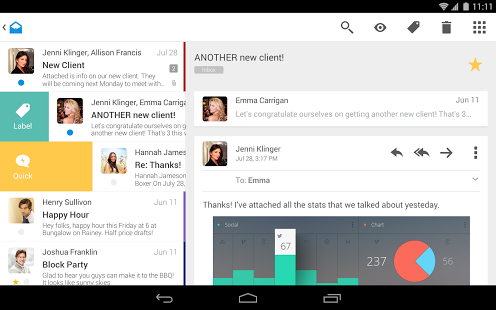 This mail client is fast and efficient, and very smartly designed. The quick replies are pretty fantastic. Boxer has a whole set of tools for dealing with emails. You can easily archive with a swipe, send instant auto responses, add emails to a to-do list, and ‘like’ incoming messages so people know you saw it without requiring an actual response. CONFIGURABLE INTERFACE – Don’t like our swipe actions? You can change them in the settings. Boxer supports all major email providers including Gmail, Outlook, Exchange (2003 and up), Yahoo, Hotmail, iCloud, AOL, Office 365, IMAP & POP3 accounts. Great tools mold themselves to fit you better over time. You’ll love the ability to quickly swipe left to archive, delete, or mark email as spam. Choose from 12 options and customize your swipes to fit your style. Important files in the cloud? With Boxer, you can attach a photo or add a file from Dropbox or Box when you compose a message. We’ve added a Like button to email. Tap Like to quickly acknowledge a friend’s message and they’ll know you “liked” it. It’s the fastest way to respond to email yet. The To-do feature moves the selected message from your Inbox to your personal To-do list within Boxer. See who your email is from with the addition of profile images. Connect to LinkedIn and Facebook to see even more profile pictures. Boxer is a true email client and connects directly to your email provider for the ultimate in speed, security and availability. For added security you can encrypt your email database on your phone using a secure password to lock your email application. I like the app but for yahoo, I don’t see emails from my various folders.. This is a huge drawback for me.. This will need to be fixed before I can make this app my primary email app.. Update : It seems that after adding Yahoo account, all the ‘user created’ folders do not get populated immediately. It requires me to go to each folder and manually refresh them. This still does not solve the problem. I then need to restart the app after an indeterminate time to see my emails. Thanks for your comments! This does sound like an issue, and we’d like to get more details so we can look into a fix. Could you please respond to this notification or send an email to support@getboxer.com? Thanks for your help with troubleshooting! Great mail app. I use it daily but needs to be polished and reliability needs to go up for a business critical app (email) like this. Great job and keep it up! They add actions to your email client that legitimately make your life easier. It takes away from the tedious tasks associated with managing your inbox. Definitely give it a try. Its us a polished app for sure.